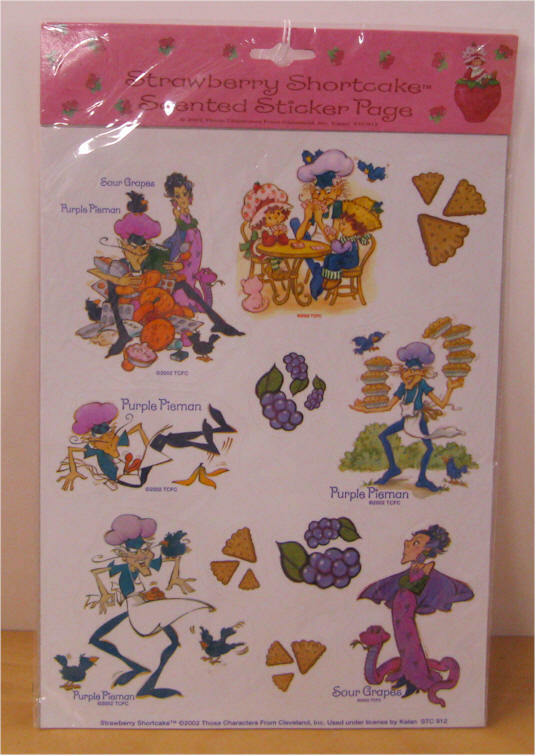 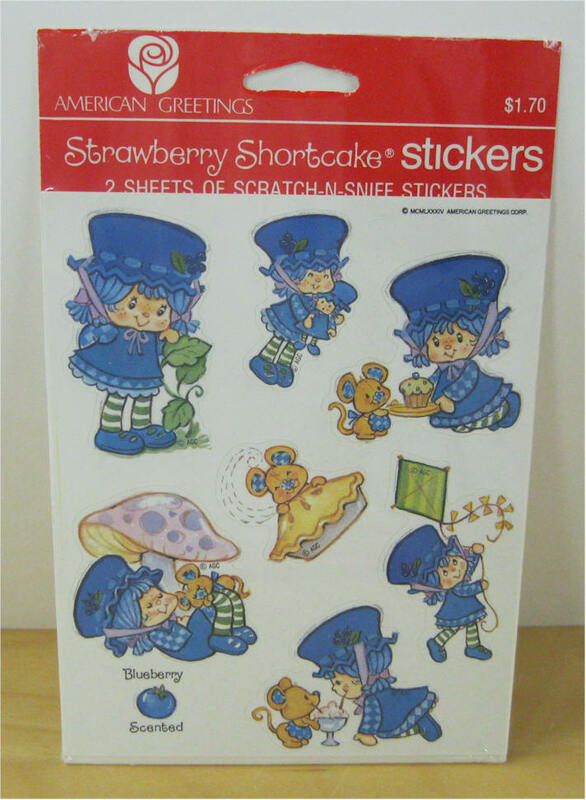 Blueberry Muffin w Cheesecake sticker - by C&D Visionary, Inc. 4 1/2" H by 3" wide. 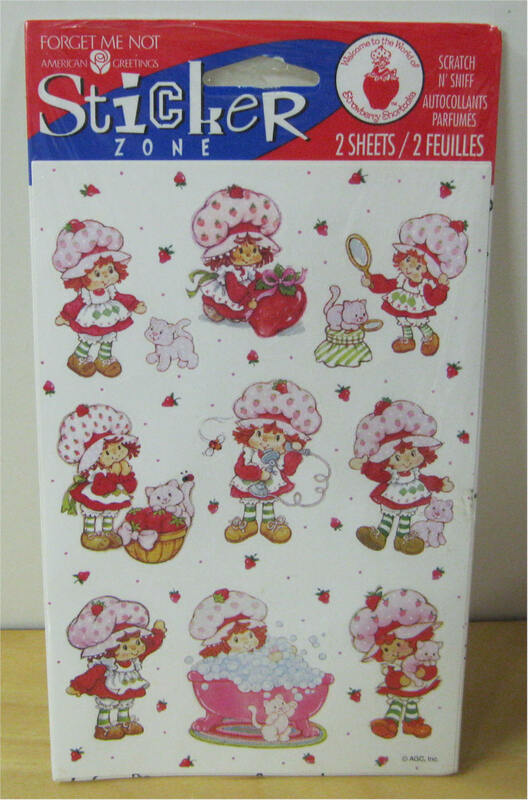 Price $4 Raspberry Tart and Rhubarb- by C&D Visionary, Inc. 4 1/2" H by 4 1/2" wide. 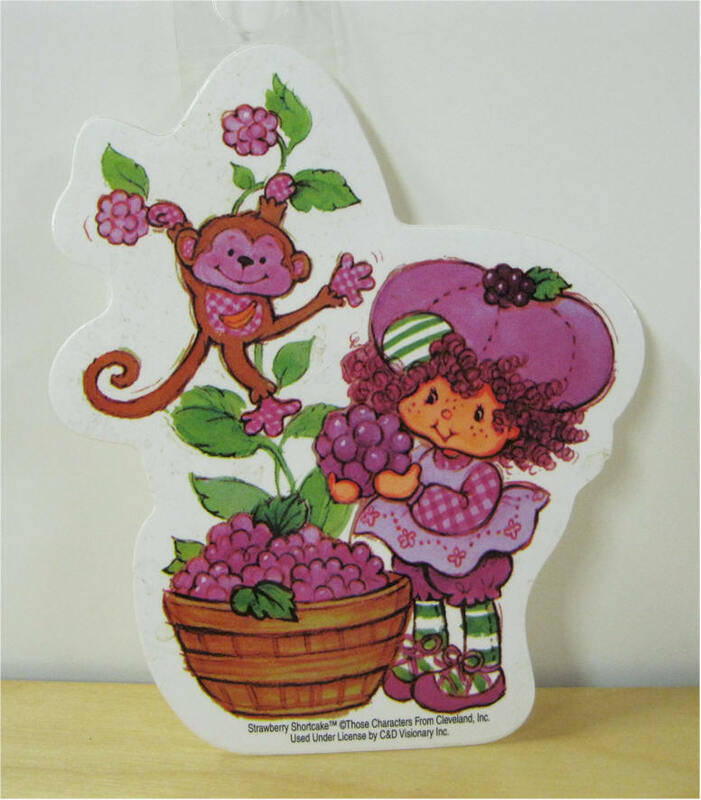 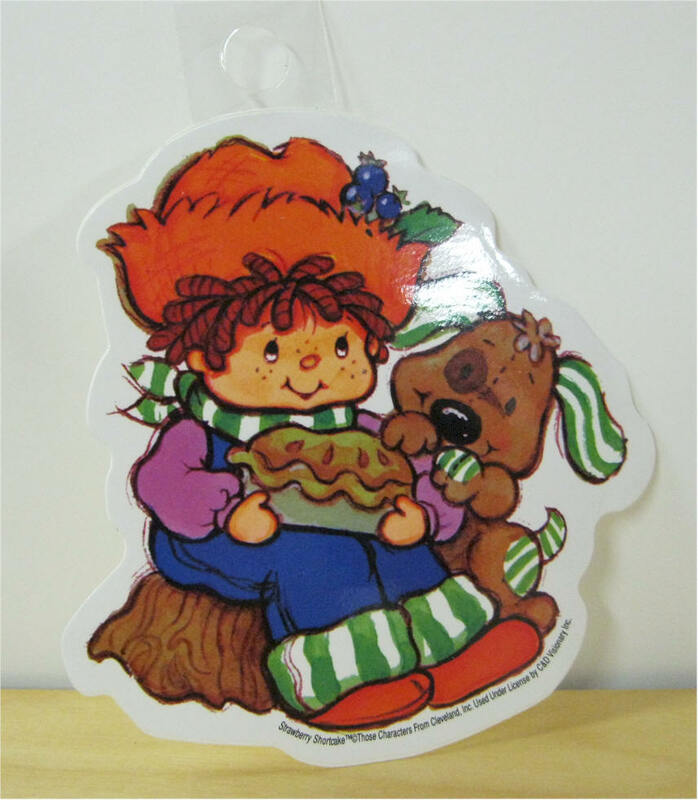 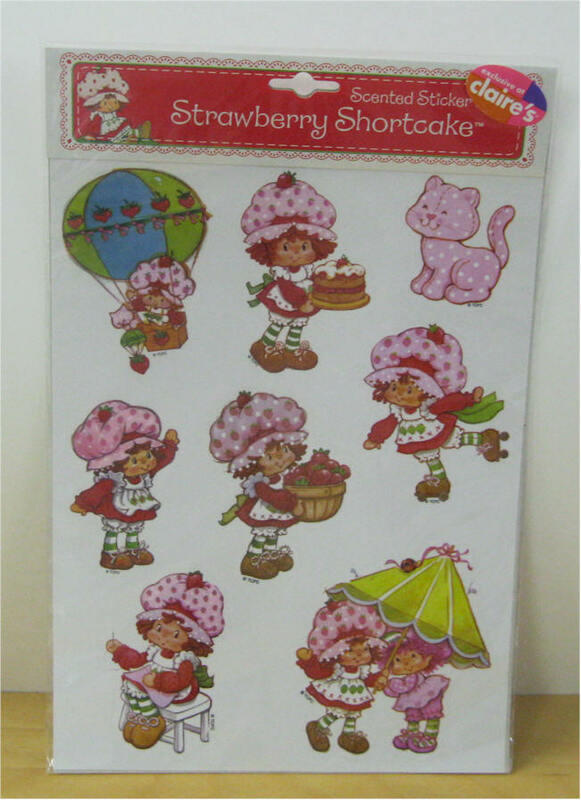 Huckleberry Pie and Pupcake sticker - by C&D Visionary, Inc. 4 1/2" H by 4" wide. 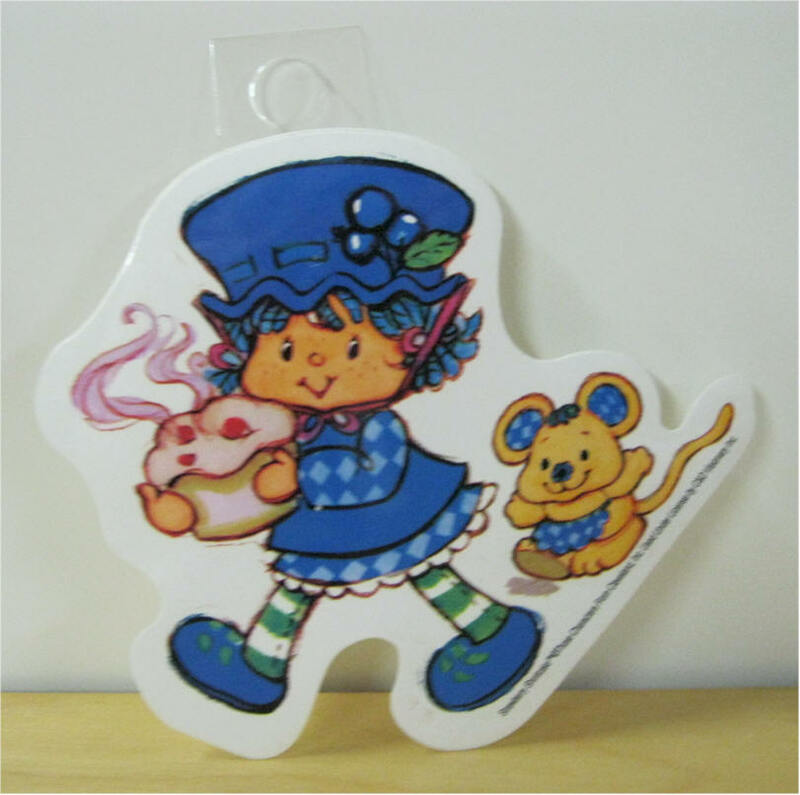 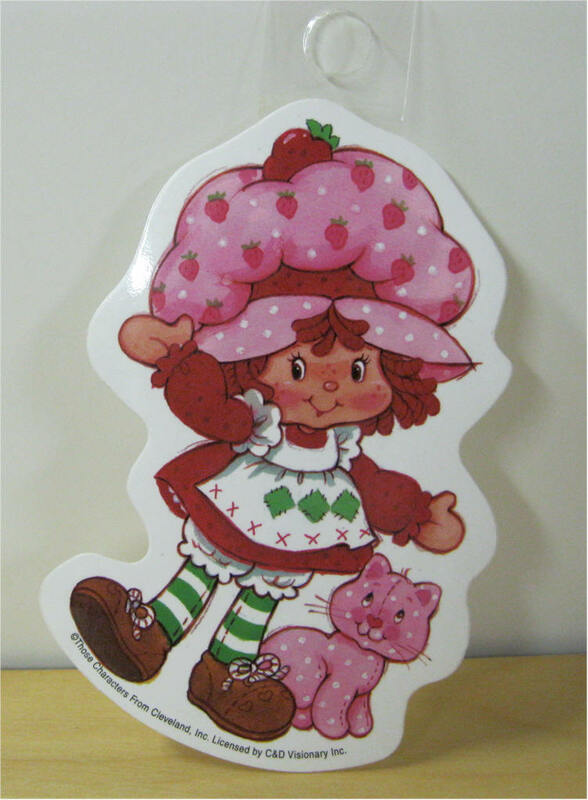 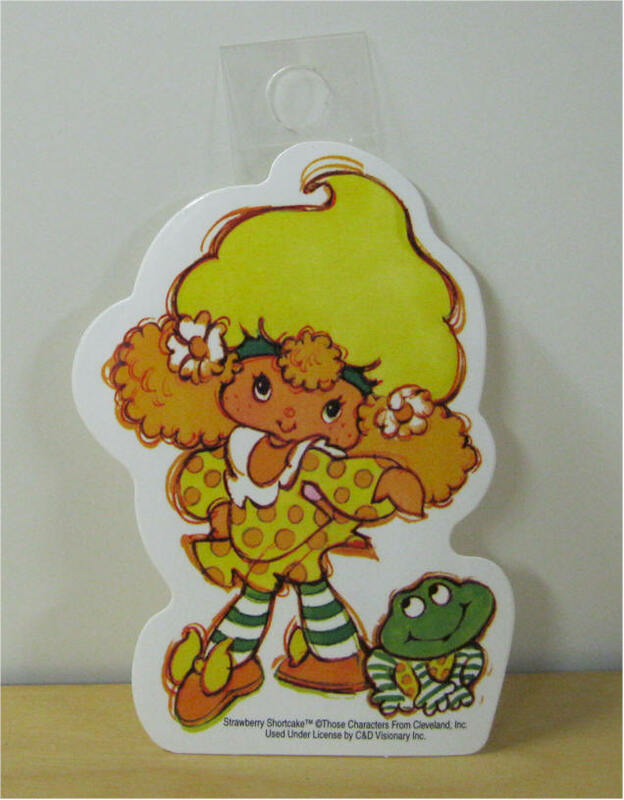 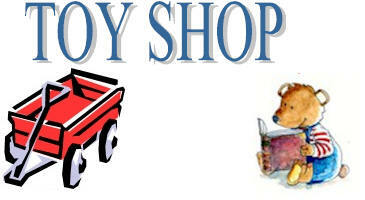 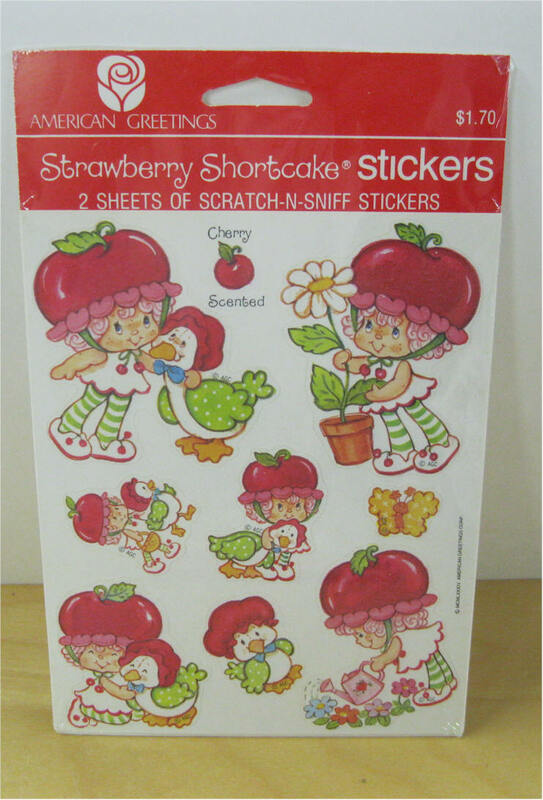 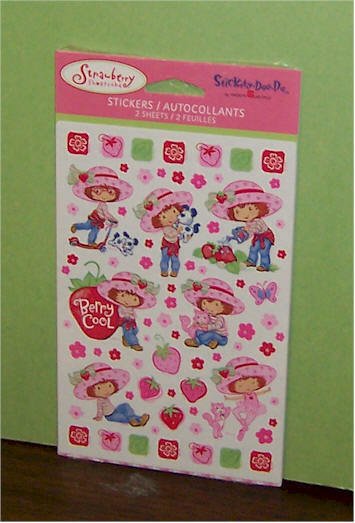 Price $4 Strawberry Shortcake and Custard sticker - by C&D Visionary, Inc. 4 3/4" H by 3" wide. 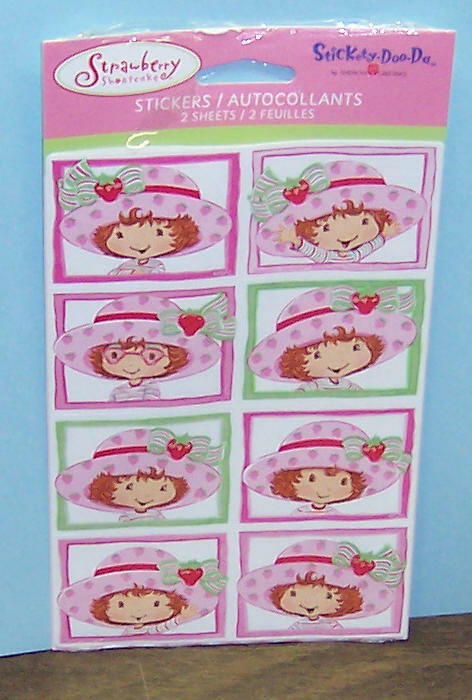 Lemon Meringue w Frappe Stickers - by C&D Visionary, Inc. 4 1/2" H by 3" wide. 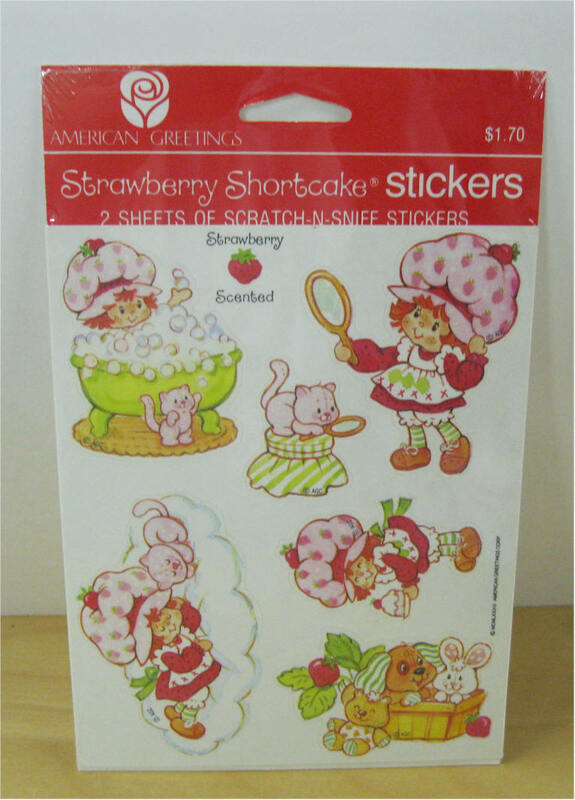 American Greeting -2 sheets of scratch-N-Sniff stickers Mint Condition never opened. 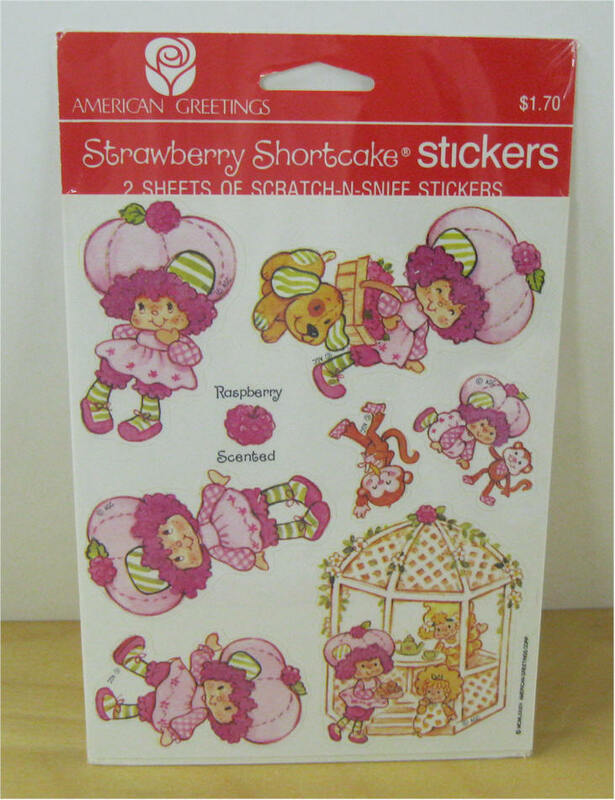 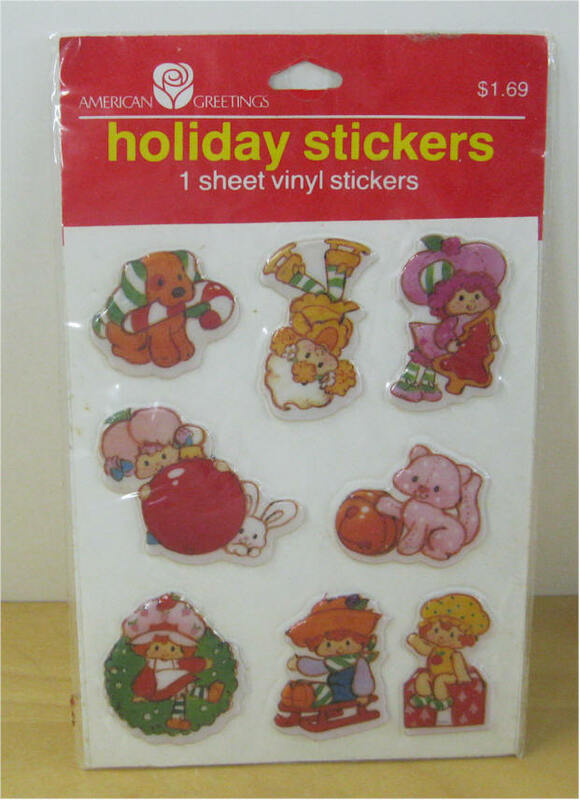 Price $48 American Greeting -2 sheets of scratch-N-Sniff stickers Mint Condition never opened. 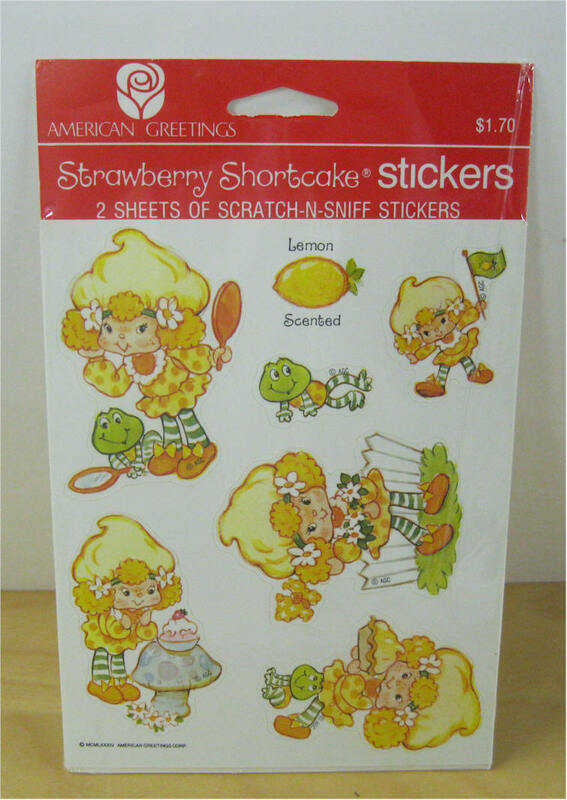 Price $32 American Greeting -Lemon Meringue 2 sheets of scratch-N-Sniff stickers Mint Condition never opened. 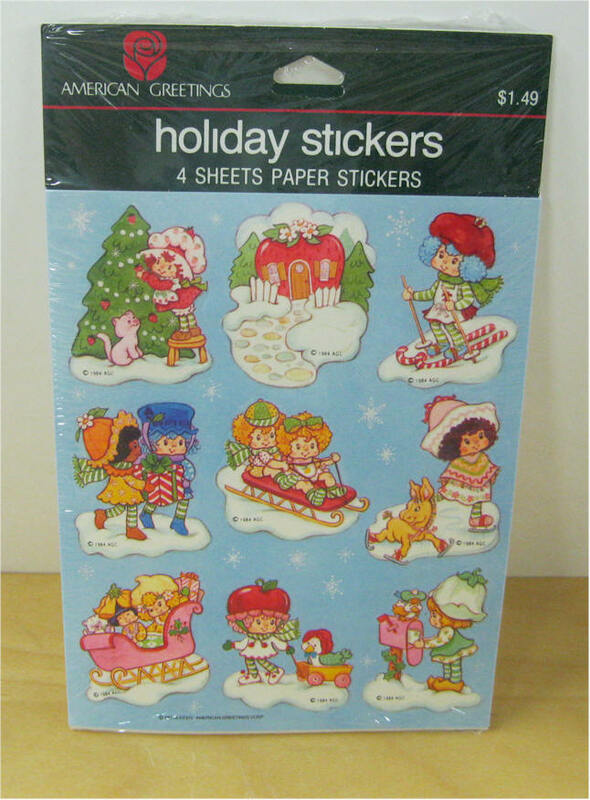 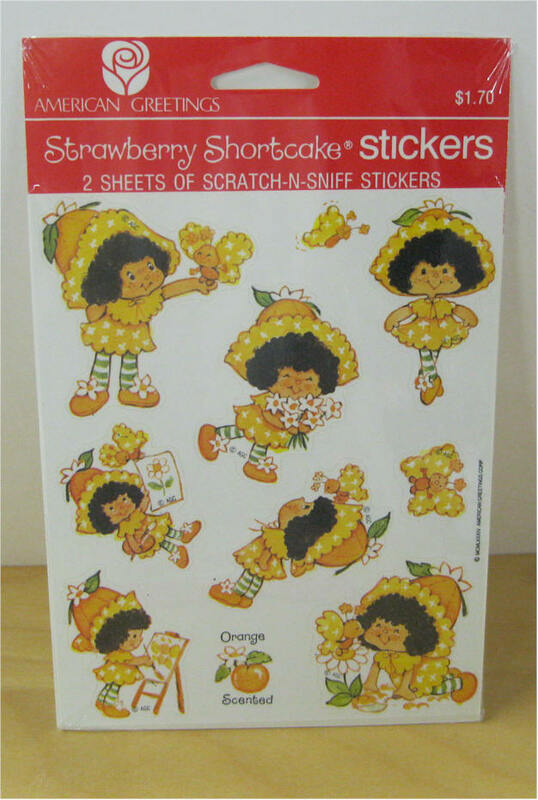 Price $28 American Greeting -Orange Blossom 2 sheets of scratch-N-Sniff stickers Mint in package never opened. 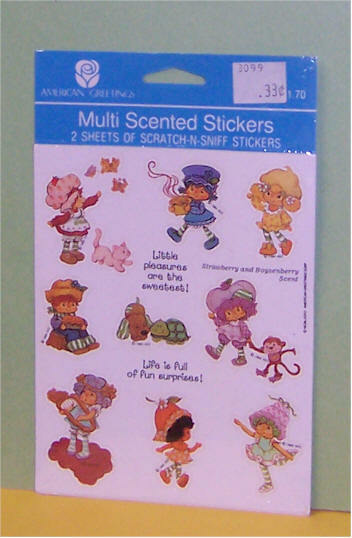 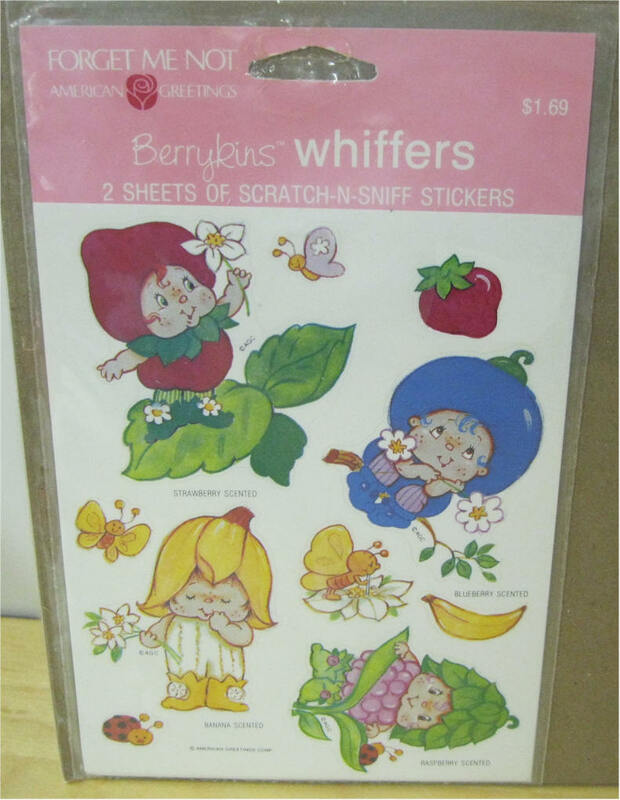 of scratch-N-Sniff stickers Mint Condition never opened. 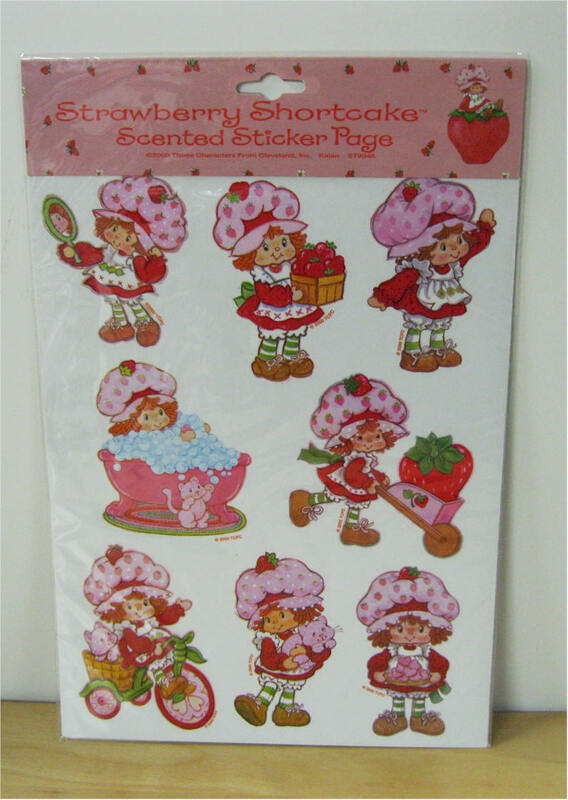 Smells like Strawberry! 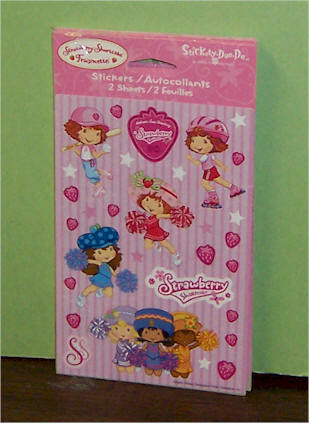 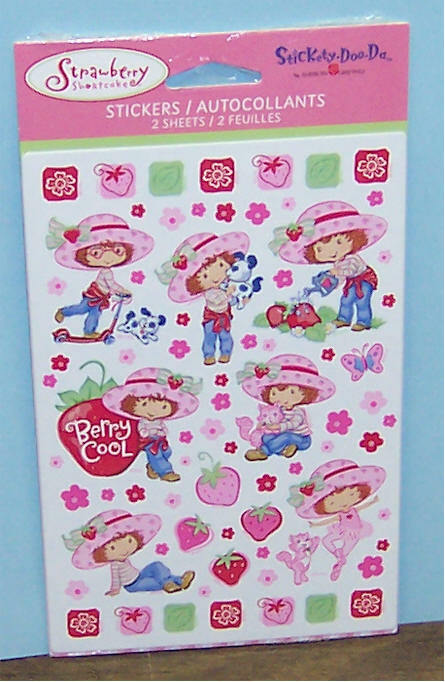 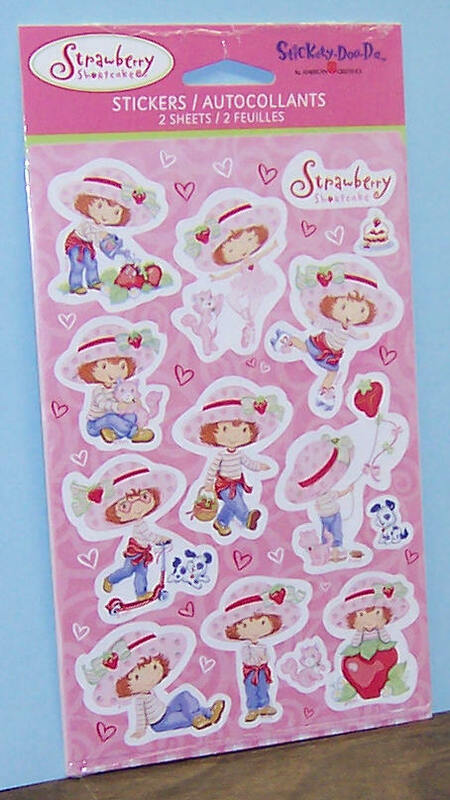 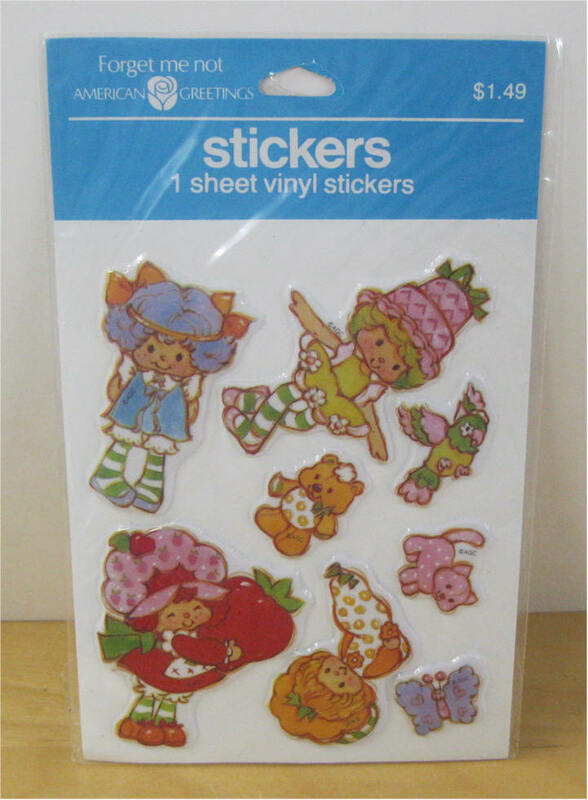 You get 8 different Strawberry Shortcake stickers on one page. 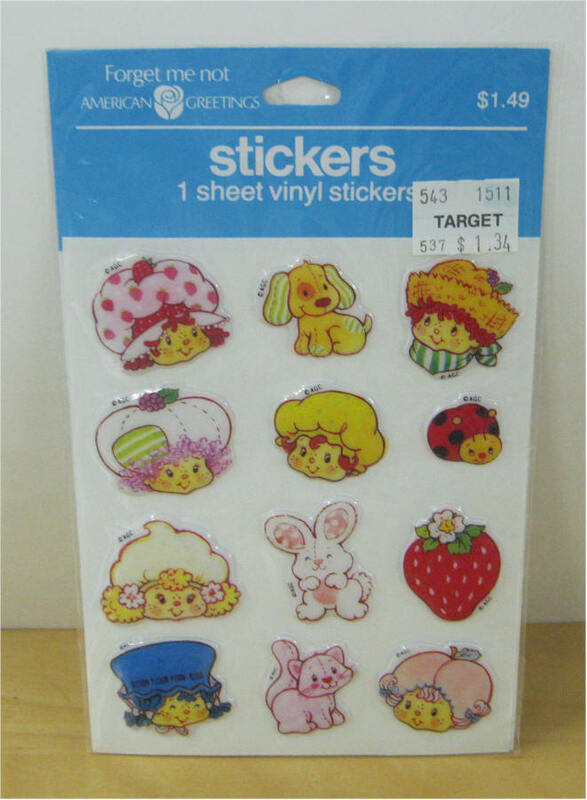 Each sticker is 3 inches high. 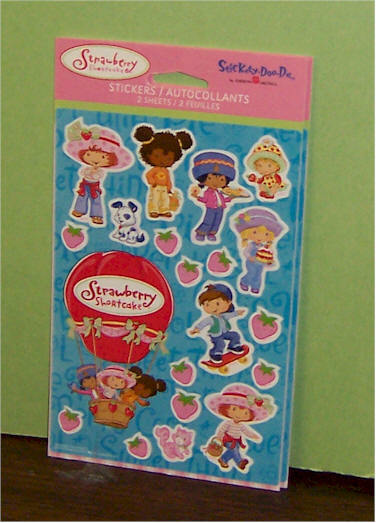 SS Stickers by American Greetings. 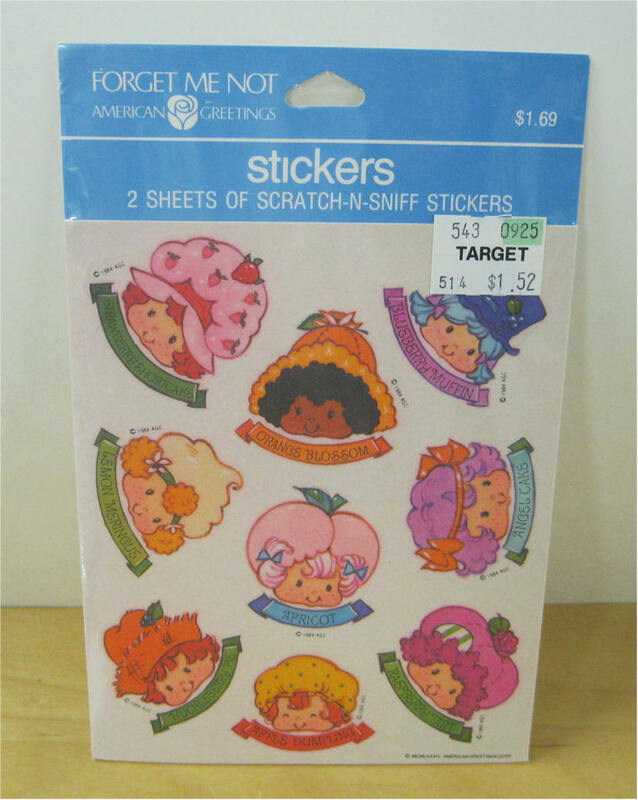 Price $3 SS Stickers by American Greetings. 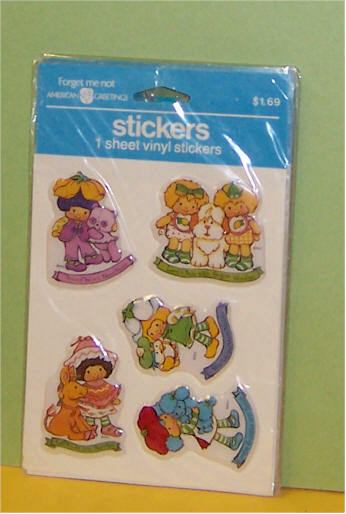 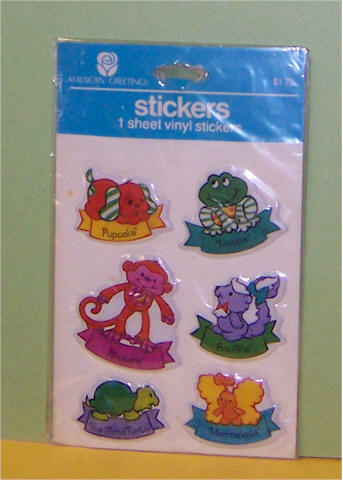 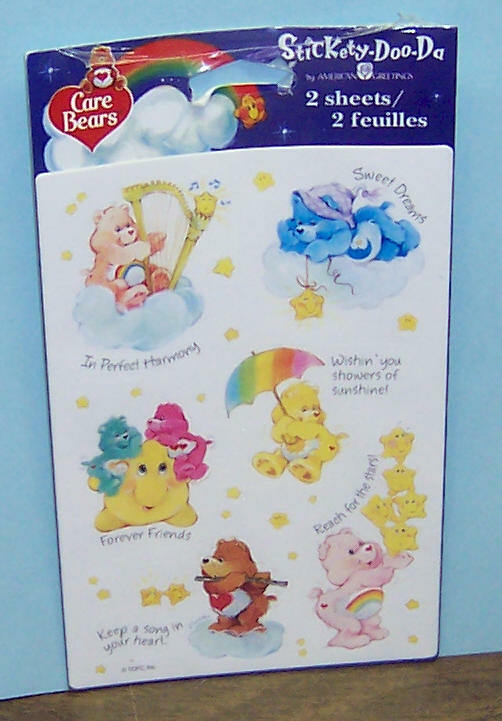 Carebear Stickers by American Greetings. 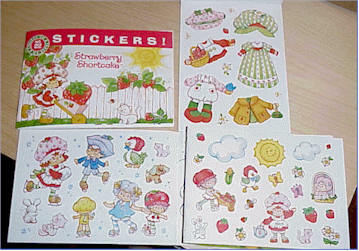 SS Stickers 5" X 5"